The wording of the union-killing bill Michigan Governor Rick Snyder signed this week was taken virtually word for word from “model” legislation crafted by the American Legislative Exchange Council (ALEC), a stealth lobbying group for corporations. The Natural Resources Defense Council has calls ALEC “Corporate America’s Trojan Horse in the States.” ALEC is essentially an exclusive club for state-level legislators and corporate representatives that masquerades as a charitable, non-profit group. ALEC charges legislators just $50 a year to join, while corporations pay anywhere from $7,000 to $25,000 a year. In return corporations get ongoing opportunities to have their lobbyists hobnob closely with thousands of state legislators. ALEC puts on corporate-sponsored confabs at tony beach and golf resorts where lobbyists get plenty of face time with state legislators and influence them to introduce their favored legislation in state houses back home. Legislators never intentionally reveal that the bills came from ALEC when they introduce them. One of ALEC’s highest legislative priorities has been passing so-called “right to work” (RTW) bills across the country to slash the political power of unions. RTW bills prevent unions from assessing a fee on “free riders,” or employees who refuse to join unions but nevertheless work at unionized workplaces and get to enjoy benefits won by union representation like higher wages and better benefits. Prior to the November 2012 elections, Gov. Snyder called RTW bills “divisive” and said he did not plan to pursue them, but all that changed quickly after the election. 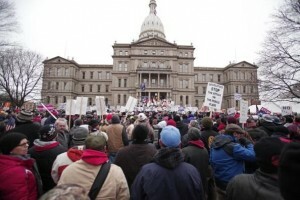 Michigan’s RTW bill was introduced quickly and legislators had Michigan state police lock the doors of the state capitol building, against a court order, to keep out the tens of thousands of protesters who swarmed the capitol while they were preparing to vote on it. A 2011 study by the Economic Policy Institute found that while proponents claim RTW laws boost the economy, in reality these bills have been proven to depress workers’ wages. In states with RTW legislation, workers earn 3.2% less and the average full-time worker in a RTW state makes about $1,500 less per year than similar workers in states without the laws.